I get a lot of questions about which email address a business should be using. So I decided to pull together a few points to consider if you are using a free account for your business email. Most people started off by getting an Eircom, Gmail or Hotmail account in college or as a personal account. It is easy to continue to use your personal account for your business. 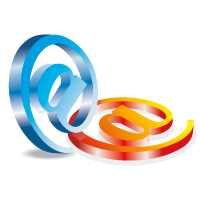 Or you may have started a new email account for your business yourbusinessname@….com with your current email provider. Now it may seem like a daunting task to change over especially as your customers know your existing email address. But with all the work you do to establish your business as credible, professional and established with a solid record of achievements – don’t let your email address let you down. Changing your email address will take a little planning and time i.e. researching the best option for your business and the process of backing up and changing it over. But at some point as your business grows you will need to make the switch. But why? If a customer has your email address john@yourbusinessname.ie it is very easy to find your website and learn more about your business and contact details. Mary has a solicitor’s firm, it has been established 15 years and has three employees. She started off with an Eircom account and uses Microsoft Outlook for her emails. She has a website, which was set up five years ago but never changed her email address. It was never discussed. John has a new practice in the same town, he opened 6 months ago. He is the sole employee. His email address matches his domain name, he promote his email and website address on all his stationary, promotional material and business cards. Mary promotes her Eircom email address. For new customers who don’t know either businesses background, which company looks more credible and established? Which business looks to have a more secure email correspondence? If you already own a domain name, it is very straight forward to set up an email address to match your domain name. If you don’t have a website yet but are in the process of starting a business. Get off on the right foot by purchasing a domain name and setting up an email address. Therefore all your emails from the start (contacting suppliers/funding) are together under your new brand name. Starting or growing your business, get in touch as we offer a mentoring service on marketing and branding your business, which may be of interest.